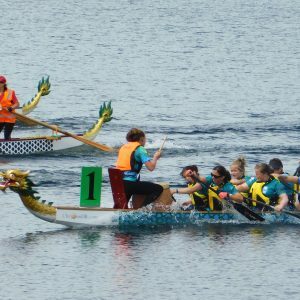 Dragon boat racing began more than 2000 years ago when a group of superstitious people believed that the boat racing would ensure prosperous and bountiful crops. The race has come to symbolize both man’s struggle against nature and his fight against dangerous enemies. The tragic tale of Qu Yuan further integrated the dragon boat races into the lives of the Chinese. The Fourth Century B.C.E. is known as the period of “warring states” in Chinese History. Many kingdoms had already disappeared, except for Chu, which was one of the mightiest kingdoms remaining. Qu Yuan was a poet and a minister and councilor to the king of Chu. He feared for the future of his kingdom and to do the best for his country, he gave advice to his king. To his surprise, the advice was not accepted and was exiled. During his 20 years in exile, Qu Yuan traveled widely. At the devastation of the kingdom Qu Yuang never regained the Emperor’s favour and in desperation and sorrow, threw himself into the Mi Lo River in. The people of Chu loved Qu Yuan. They grieved over his death and spent much time trying to scare the fish and water dragons away from Qu Yuan’s body by rowing around the river in their fishing boats, splashing their oars and beating their drums. As to ensure Qu Yuang never went hungry, they wrapped glutinous rice in leaves (zong zi) and threw them into the river. Zongzi are still eaten today as part of the dragon boat festivals. The Dragon Boat Festival is typically celebrated “the Fifth of the Fifth” – the 5th day of the 5th month. Red is the predominant colour on the boats because it is the colour of the number 5 and symbolizes heat, summer and fire. The lengths of the boats can range from 30 – 100 ft but are wide enough to barely fit two people side by side. Some of the original rituals are still practiced today, like the “Awakening of the Dragon” by dotting the eyes of the dragon’s head on each boat with red paint. This ceremony is conducted to cleanse and bless the area of the competition, the competitors and their boats. It also gives the boats and their crews the strength of the Dragon and the blessing of the Goddess of the Sea. The crowd no longer throws stones at the rival boats and it is not imperative that a boat capsize and at least one person drowns – which was once considered a special sacrifice to the gods and was, surprisingly, a sign of good luck! Brave Hearts Dragon Boat Club is a competitive sporting team of dedicated paddlers who train together for fitness, learn timing, technique and working together as a team. To have fun and make friends! The Club is run by a group of volunteer paddlers for paddlers. We compete at local, State and National Dragon Boat Regattas. Competition is important to us, as well as the fun, laughter, team spirit and determination that makes our club inclusive of all abilities. We have qualified coaches who run regular training sessions with an emphasis on working as a team, whilst supporting each individual to strive to their own personal best. 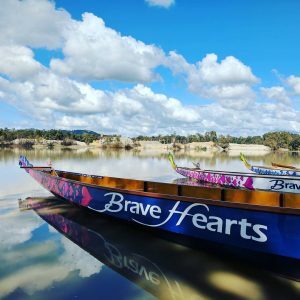 Brave Hearts offers pleasure paddling on Sunday afternoon for those who would like to keep up their fitness and friendships without competing in regattas. Brave Hearts Dragon Boat Club welcomes any gender over 10 years of age. Our current members range from 11 to 80 years of age. 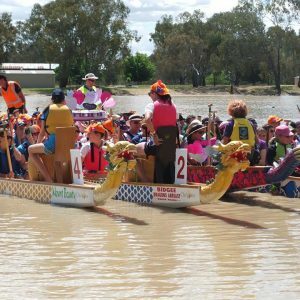 The club formed in 2006 after a group of breast cancer survivors built their own dragon boat at Riverina Institute of TAFE, Albury Campus with the help of volunteers and teachers. The boat hangs in our shed and is the pride of our fleet. It is mainly used for ceremonial purposes. Our club is located at Gateway Lakes Albury/Wodonga in the green shed at the end of Lemke Rd, Wodonga Vic (off Lincoln Causeway).